This year is flying by, and I’m churning away at the TBR list like there is no tomorrow. My days consist of writing, reading, editing, reviewing, and researching on a repeat loop, but I wouldn’t have it any other way. Sure, I throw in an occasional exercise routine. Weights here, a little cardio there, a recovery cookie for dragging myself through the mental prep it takes to force each pained step through the above “recommended” exercises. Now, hear me out, I’m a healthcare professional, in addition to penning books, who values keeping the body healthy. Having stated the obvious, I don’t have to say I “love” it, or even “like” it, but all in all, I appreciate what exercise can do for my mind, body and writing. 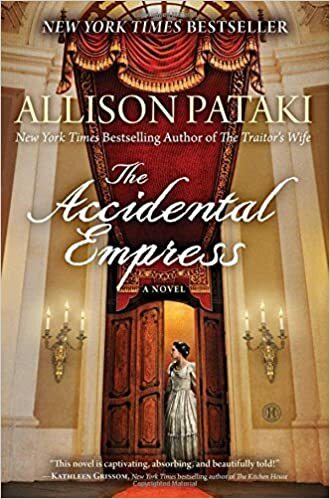 What I do “love” is a great book, and boy do I have two I’m raving about today: The Accidental Empress by Allison Pataki, and Flyte by Angie Sage. Yep, they are from different genres, the first is historical fiction and the later from fantasy fiction, but I do love reading various genres. I find that it enhances my writing in a number of ways. But, I digress. These masterful written and entertaining pieces of art command attention from the get go, and I’m excited to review them for you today. Book Blurb via Amazon: “A New York Times bestseller, The Accidental Empress is the “captivating, absorbing, and beautifully told” (Kathleen Grissom).love story of “Sisi” the Austro-Hungarian empress and wife of Emperor Franz Joseph. Discussion: Okay, as most historical fiction’s go, the 512 pages may seem overwhelming at first glance, and if you’re new to historical fiction, then this may be the absolute turning point in the decision to pick up the book or not. However, Pataki’s superior grasp on weaving an extraordinary tale gleaned from true life accounts of a young empress, plucked too soon from the protective confines of her childhood home, will leave you yearning for a sequel. And not to disappoint her fans, Allison Pataki hints at a possible continuation as the life of Sisi is too luminous and compelling to contain in one formidable book. As far as the historical significance of the book, Pataki rarely strayed from actual accounts of Empress Sisi, and I owe a monstrous “Thank you” to her for that. It’s disappointing to read a historical fiction book that strays too far from the truth, and Ms. Pataki doesn’t disappoint. Her genius lies in the way she embodies Sisi’s imagined thoughts during her lifespan that keep the reader glued to the pages and wanting for more. I found myself wondering how it would feel to be plunged into the depths of the Hapsburg family without a life raft or boat, some kind of anchor to hold near. Not even her mother, who lived days away, could soften the blows of an overbearing MIL or the estrangement of her husband. If you haven’t been introduced to Allison Pataki’s books, I’d advise you to take a look. She pens a book better than most, and she’s a credit to the historical fiction genre. Ages: 8-12, but Adult’s love it too! “It’s been a year since Septimus Heap discovered his real family and true calling to be a wizard. As Apprentice to ExtraOrdinary Wizard Marcia Overstrand, he is learning the fine arts of Conjurations, Charms, and other Magyk, while Jenna is adapting to life as the Princess and enjoying the freedom of the Castle. Discussion: The second book in the Septimus Heap series, Ms. Angie Sage continues the fascinating and nail-biting adventures of Septimus Heap, Princess Jenna, Nicko, their dragon boat, and a mystical world of magic waiting for the reader who dares to turn it’s pages. The castle, in disarray, anxiously awaits the return of Septimus amongst the chaos of the Extraordinary Wizard, Marcia, whose sinister dark shadow grows ever more tangible with each passing day, threatening the demise of her charge over the castle and those seeking to keep the wizarding world from falling into evil hands. Ms. Sage uses vibrant descriptions, placing the reader directly into the surroundings, which I find difficult to write, but it’s effortless for her. The terminology, spells, and background stories all compel me down the rabbit hole of Flyte. What an adventure! Likable for all ages, Flyte touches on the nuances of parental struggles, sibling rivalry, and the typical angst of growing up all compiled into one. A quick and easy read, I’m grabbing the next in the series, “Physik,” faster than a toddler throwing spaghetti onto a wall. For lovers of magical fantasy, please check out Angie Sage. So, what’s next on my TBR list? Well, I’ve got quite a few, but I’m always interested in your thoughts! Please, comment below on books or series that make your list of favorites. I love Indie authors, too! As a matter of fact, I’m reading an indie book right now in the midst of a plethora of books I’m using for research. A author’s work is never done!